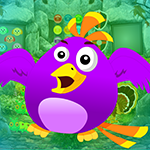 G4K Purple Bird Escape is another point & click escape game developed by Games4King. There were a few houses in a beautiful and magnificent village. The place was beautiful to see. There was a purple bird living there. One day, that purple bird got unexpectedly stuck in a house. It is your duty to rescue the purple bird. It will help you to find the hidden clues in the form of colours and numbers and to find the items where the purple bird is to save the animal. Find them all and solve all puzzles to free the purple bird. Good luck and have fun! Key from turkey, scene left of start. Flip moon button in inventory for clue. Hatchet for tree in scene with yellow skull/x-bones and bug door. Knife for barrel in scene where you place car. 3245 for scene with dog.